Niçoise salad, sometimes referred to as Salade Niçoise or insalata nizzarda, is a type of salad. As suggested by the name, it is a specialty of the Cote D'Azur region of France, originating in and named for the city of Nice. The salad is carefully displayed on a flat plate or platter and arranged on a bed of crisp Gem, Cos or Butterhead lettuce, first made popular in the Montpelier Region in the 1880's. The vegetables are carefully and individually prepared, then arranged by group. Ripe tomato wedges, halved boiled new potatoes, steamed green bean, wedges of hard-cooked eggs, are topped with canned tuna (tinned in oil), and native Nicoise olives. Finally the salad is garnished with tinned anchovies. The salad is served with traditional Dijon vinaigrette. 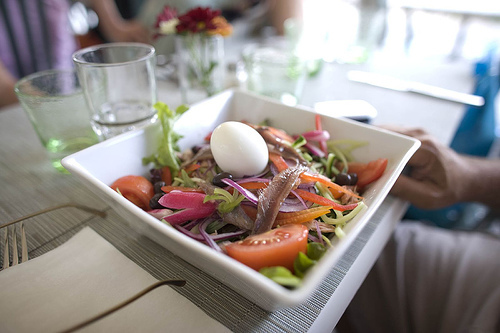 Salade Niçoise and its ingredients are often debated by purists. The original version of the salad always included raw red peppers, shallots, and artichoke hearts, never potatoes. A common debate is the use of lettuce, which differs from village to village.